After his crucifixion, Jesus pays a visit to his disciples. They are terrified, thinking he is a ghost. He tells them, I am no ghost. And to prove it, he asks, do you have anything to eat? And they give him a broiled fish. Most of us have seen paintings of Jesus in the manger, or in the cross. But what about Jesus eating a fish? Some of the earliest known Christian art comes from the Roman catacombs, the vaults below the city where tens of thousands of early Christians were buried. Crosses and mangers are rarely seen there, but fish are commonplace. And not just the stylized, abstract-looking fish you see on modern car bumpers; these are actual fish, realistic-looking fish with scales. 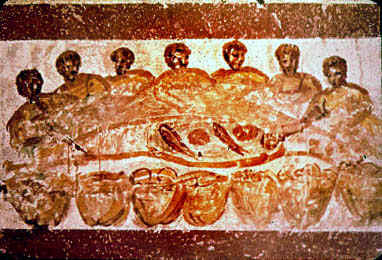 Sometimes the fish is depicted by itself; sometimes it is part of a dinner scene. There are multiple images of people gathered around a table, sharing a Eucharistic meal — not of wine and bread alone, but of loaves and fishes. 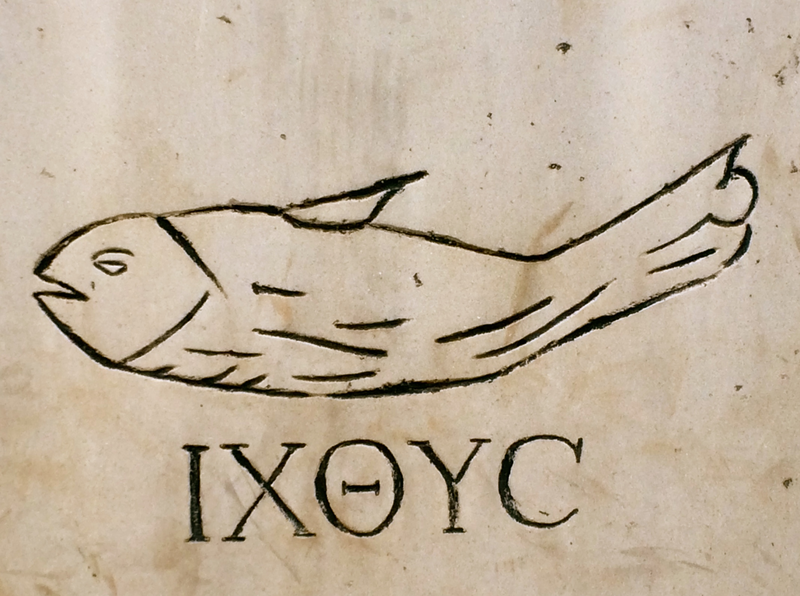 To the early followers of Jesus, fish was apparently as integral to communion as bread and wine. Imagine our deacons passing around plates of smoked salmon at communion, and you begin to see just how much our tradition has changed. A meal of bread and wine is a tidy affair. You can serve them up as bite-sized wafers and individual, sanitary shotglasses. But eating a fish – that’s a messy, visceral sort of experience. There’s bones, and scales, and gills to contend with. There are eyes, looking up at you. You know you are part of the food chain, when you are eating a fish. And maybe we feel a little uncomfortable, imagining Jesus pulling flesh from bone with his fingers. But here he is, in Luke’s gospel — Jesus, raised from the dead, eating a fish. The Greek word for ghost is pneuma – it means literally, breath, and metaphorically, ghost. As in, Holy Ghost. It’s the same word. Nowadays we usually translate it as Spirit. The disciples are terrified, for they think Jesus is a ghost, a spirit. But although Jesus promises the disciples that God will send a Spirit to guide them, he makes it clear that he is no Spirit. Jesus is no Holy Ghost; he is a living human being, eating a fish. Flesh and bone, made from flesh and bone. Still, there is a sort of dream-like quality to these post-resurrection encounters with Jesus. The disciples start off talking with a stranger, and then somehow that stranger is Jesus. No one ever seems to see him coming, or going; he is just somehow there; and then, he is just somehow gone. These are the sort of things that happen when we dream. But then, on the other hand, here he is, eating a fish. So is Jesus a vision, or is he really there, in the flesh? Does it matter? Saint Paul saw a vision of Jesus on the road to Damascus, and it was enough to change his life. Thomas – also a saint – needed to touch Jesus’ living body with his own living hands. Can we be satisfied with a vision of the resurrected Christ? Or do we need something more, well, earthy? It’s an old debate in Christianity: is Christ flesh and blood, or merely spirit? From the beginning, there were those that argued that Jesus was not truly a human being, but rather a spirit in disguise — human in appearance only. But it wasn’t just the idea of resurrection that bothered them; it was the whole idea of incarnation. The word made flesh, in the birth of Jesus. It wasn’t just that they couldn’t believe he had come back to life; they couldn’t believe he had been alive in the first place — at least, not in the biological, organic sense of the word. They just could not believe that divinity would sully itself with the blood and guts of biological existence. They wanted a God who would rescue them from the world, not become mired in it with them. But for others, that was precisely the good news. The union of Word and Flesh – of the Mystery and the Mud. A couple of years ago, my daughter had a good friend that lived next door to us, so the two kids used to run back and forth between the houses and play in our combined back yards. One day, the kids were outside and both my neighbor and I were inside, doing the dishes or something, and the kids discovered a mud puddle in the backyard. And they began to expand it, and it grew into a sort of a mud wallow. And the hole got bigger and bigger, and they got muddier and muddier, and somewhere along the way they come up with the idea to build a mud slide. On our porch. So they got a couple of buckets, and began hauling mud, and at some point my neighbor and I went out to check on them – whatever you are picturing in your minds right now, it was worse. But the thing is, neither my neighbor or I could bring ourselves to be angry with them. We made them clean it up, to be sure; but there was such delight and exuberance in their bodies and on their faces, that neither of us could bear to change that moment for them. They had found the mystery in the mud. Now I know there are some of you out there who are probably shaking your heads over my parenting skills. But I do think we sometimes make a mistake, when we equate cleanliness with godliness. Because life is messy. Our bodies are messy, our food is messy, our planet is messy. And yet God created it. And God loves it. So much so, that God became flesh in Jesus, in order to love it better. What about us? Can we bring ourselves to love the world? Can we say YES to this creation, to our creation? Because I’m not just talking about sunsets and mountains here. Because life is messy, and nature can be harsh, and God knows, people can be cruel. It’s understandable that some of us might want to distance ourselves from our mortal flesh; that we might seek a savior who would rescue us from such a world as this. But just as the incarnation did not begin with a baby in a manger, so it did not end with a body on a cross. Because even after his death, there is Jesus, eating a fish. When Jesus escapes from tomb, he jumps right back into life, in all its messy biological incarnational splendor. Vision or not, he is, emphatically, not a ghost – not a disembodied spirit, but an embodied one. Like you. Like me. We are tempted, sometimes, to act as if we were disembodied spirits, or rather, as if our bodies are nothing more than machines, our food nothing more than fuel. If our performance gets sluggish, we add some high-octane caffeine to the tank, and keep driving. One of my seminary professors once observed that now in the digital age we treat our biological bodies as if they were merely our avatars, rather than our selves. We are like Pinocchio in reverse – flesh and blood children, pretending to be puppets. We do not fully inhabit our bodies, or love them, or care for them; just as we do not fully inhabit, or love, or care for the planet that sustains them. But if we deny our own incarnation, how shall we acknowledge our incarnate God? If we cannot not love creation, how shall we love our Creator? So maybe it wouldn’t be such a bad idea to serve up some broiled fish for communion now and then. Bread and wine, after all, are a few steps removed from their organic origins; but a fish, that’s another story. Eat a fish, and you know the stuff of which you are made. You are flesh and spirit, mystery and mud; and God loves all of you. This entry was posted in Mud Wrestling, Sermons and tagged communion, eucharist, incarnation, luke 24: 36-49, resurrection. Bookmark the permalink.